I found Frank’s flashbacks of his past an interference and confusing and I felt the pubescent overtones of the book did not transfer to the screen. I thought Frank felt much more menacing in the movie than in the book and several people felt the ending of the movie was more ambiguous than the book. The reasons for Adele’s fragility weren’t as clear in the movie so it was harder to sympathize with her character. A few of us found the music that played during the movie annoying. We did think the acting was good and felt they did a good job capturing the time period. The movie is worth seeing but, if you’ve just read the book, you might want to wait and rent it. Well I have to see this movie; I’ve been hearing so much about that peach pie scene! How awesome that your book club got to read the book and see the movie! One of the things that annoy me at movies is music that is distracting, so thanks for the warning. I really want to read the book and see the movie. I think I’ll miss her reasons. I loved her vulnerability. I’ve been hearing the same thing about him seeming more menacing. In the book he was so respectful and kind I thought. Great honest review. I love your power to break it down and keep it simple and concise. My book club members all agreed that Frank’s backstory was not handled well in the movie. If you didn’t know his whole story, it was harder to have a handle on his character. I didn’t read the book, so I’ll probably skip this one, or stream it later. I THOUGHT about quickly reading the book, but chose Winter’s Tale instead. I’m not sure if that was a good move or not. 800 pages of a very complicated book is probably not going to translate well. I read the book in 2009….so the movie did not suffer by comparison for me…except for the ending. 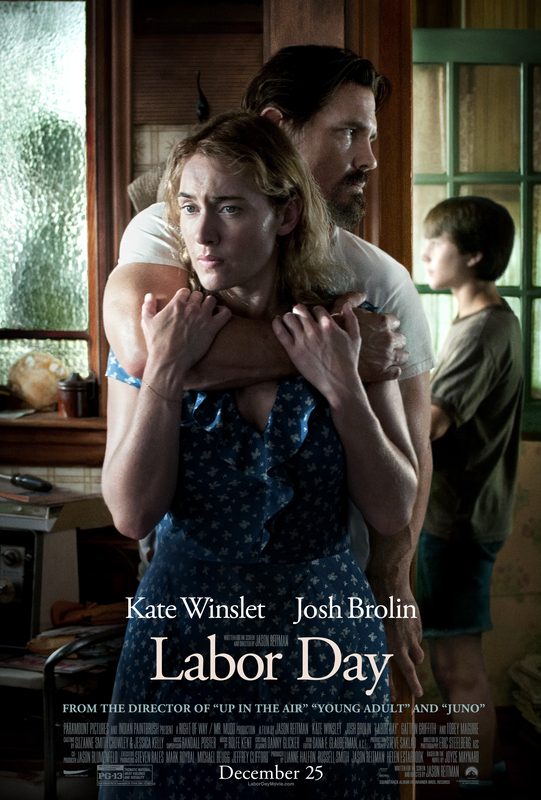 Otherwise, I loved the performances of Kate Winslet and Josh Brolin, who are awesome, IMO. What a treat to see this film with your book club! I read this when it was first released, and liked it, but I forgot the details now. Probably will wait for the DVD. Like Diane, I read it a few years ago. I think we’ll add it to the netflix queue. It’s been ages since I read it, so I think I’ll be fine if I rent the movie. Not a big fan of watching in a theater anymore. I started reading the book but I don’t think I’m going to ever finish it. I’ll probably wait and watch the movie on DVD. I saw the movie without having read the book but now I want to read the book – if only to see where the movie departed! I was encouraged to read that the author was very pleased with the movie and very involved in its development. I know I’d be disappointed. Rarely is a movie better than a book and I really liked this book. I haven’t read this book or seen this movie, but I did just finish a Joyce Maynard book, it was VG. I’d love to see this movie, though I should probably start with the book. I enjoyed the Maynard book and I hope to see the movie or maybe will wait till the rental. I’m not expecting it to be better than the book but I’m curious about the actors, so want to see it. Our book club is reading this one for February and there’s talk about going to see the movie as well. Honestly I have such little time away from the girls that I’d rather go see something that I know that I’ll love. I keep hearing this one is a disappointment. Too bad as I LOVE Brolin and Winslet.